Join Dogfish Head Brewing Ambassador Bryan Selders for Beers with Bryan on Monday, Feb. 25! Join Dogfish Head Brewing Ambassador Bryan Selders for Beers with Bryan! Beers with Bryan is a monthly pow-wow where you’ll have the chance to pick Bryan’s brain and talk all-things beer. Everything from brewing, Dogfish history, the future of Dogfish, food pairings and a Q&A session. For just $15,you’ll get two pre-selected pints and snacks to pair with the beers, and—BONUS—you get to keep your pint! 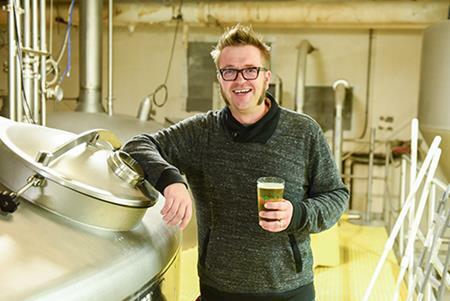 And as if that isn't awesome enough, Bryan will also take you on a private tour of our Rehoboth brewhouse! Only 12 spots are available each month, so give us a jingle at 302-226-BREW to book your spot before it’s too late! Tickets are $15 each and include two pre-selected pints and snacks to pair with the beers, and—BONUS—you get to keep your pint!